Deciding on a project management system is never easy! Choosing Redbooth was a serious process at Horse & Cart marketing agency. When we found out our former task-management tool was shutting down, we were hard-pressed to find something similar that the whole team could use. So what to do next? Having started with the company in its infancy, with two partners and myself, we soon grew to five full-time staff members, 17-35 separate clients with guest accounts, and up to eight freelancers or contractors working on any given project. Over the past year, we’ve continued to grow rapidly and expand our list of clients. We’re now seven full-time staff, two part-timers, three interns, plus contractors, freelancers, clients and other stakeholders. It was getting difficult to keep all necessary parties in the loop, especially contractors that didn’t have company-branded email addresses! My mandate was initially to find a free or inexpensive application that would help us manage our tasks and projects. We’re also a group of aesthetes, which meant the app had to have a beautiful, clean design. Some team members are less technically savvy than others, so it had to be easy to use. I also found apps like Do.com to be very limited in the project management capabilities. There was no Gantt chart, no workload view, and definitely no HD video meetings! We were also using Do.com as our CRM, so we preferred to keep using our project management software for business development and client management purposes. It just makes things easier in terms of having all of our information all in one place! I tried out more than 50 different programs with our company in mind (you name it: Flow, Wrike, Asana, OneDesk, Azendoo, JIRA, etc). I searched through all kinds of solutions. I tried them all out for periods of one hour to three days. Only one or two came close to meeting my requirements, and Redbooth won for best design, workflow flexibility, not to mention being the most intuitive to use. Beyond that, it’s as simple or as powerful as each team member needs it to be. The alert options are customizable according to how you work, and I knew that would please my colleagues as they are very particular about their workflows. For example, I like to list out all of the components of a project into a task list at the beginning of a project. But I don’t fill in dates or assign more than the first two or three tasks until I get a better understanding of the scope. Other people don’t list out tasks until the task is fully scoped out and a due date is agreed upon. There’s also equal measures of push/pull where some tasks get put up without assignment and we get to choose whether to take them on. But more skill-set-specific tasks (such as programming) get assigned to a developer right off the bat. All in all, even our interns really enjoy and appreciate using the program. It’s a whole lot less annoying for them to ask us every morning what to do. They have a set of tasks they’re responsible for and we can review their work directly in Redbooth even if they’re not in that day. Our clients also really enjoy the insight into the work being done and the ability to comment as we iterate on our work for them. For example, many of our clients don’t have a lot of experience with the web. This means they would ordinarily only see rough mockups and then a final product without realizing the 15-20 other steps that go in between submissions. By allowing our clients some transparency into the creative process, we find that we reach a consensus with our clients much quicker and more often than without this tool. The real kicker for us was the time-tracking option. We had also switched accounting systems around that time, and were no longer tracking our hours. Redbooth made sure we were still able to do that without introducing yet another third-party system into the company. It’s been about 9 months and we’ve definitely noticed an uptick in productivity, better client relations, and of course – it’s so much easier for the team to find and share important documents. 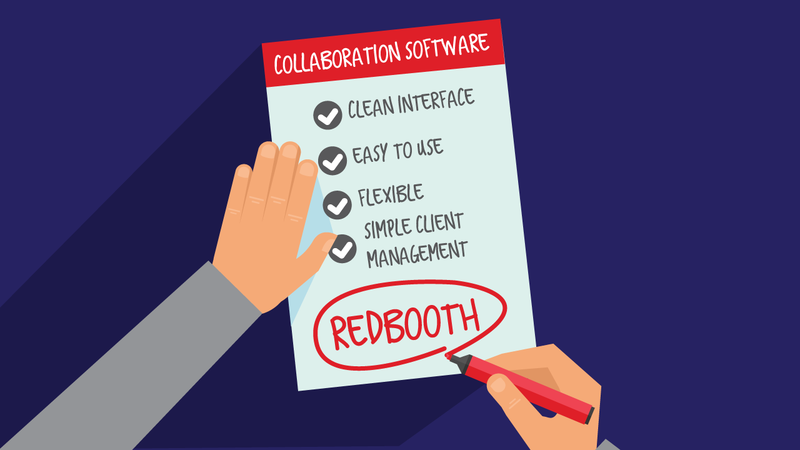 Redbooth allows us to communicate better and to truly collaborate both online and in real life! Leila Nathaniel is a project manager extraordinaire who wants to be reincarnated as a cell in a spreadsheet. She makes a lot of lists and keeps everything running at Horse & Cart Agency in Swiss-style precision. Leila takes pride in managing many of their projects, accounts and even the office. With extensive PR, copywriting, social media and event management experience, she's no one-trick pony.